and Gynaecological problems (abnormal menses, infertility). These conditions can cause or contribute to premature death and substantial disability. Cardiovascular disease - mainly heart disease and stroke - is already the world's number one cause of death, killing 17 million people each year and diabetes has rapidly become a global epidemic - according to WHO projections diabetes deaths will increase by more than 50% worldwide in the next 10 years. Less common health conditions associated with increased weight include asthma, hepatic steatosis and sleep apnoea. Overweight and obesity and their associated health problems have a significant economic impact on health systems and the medical costs associated with overweight and obesity have both direct and indirect costs - direct medical costs may include preventive, diagnostic, and treatment services related to obesity, while indirect costs relate to loss of income from decreased productivity, restricted activity, absenteeism, and bed days and the income lost by premature death. Under-nutrition and obesity often exist side-by-side within the same country, the same community and even within the same household and this double burden is caused by inadequate pre-natal, infant and young child nutrition followed by exposure to high-fat, energy-dense, micronutrient-poor foods and lack of physical activity. 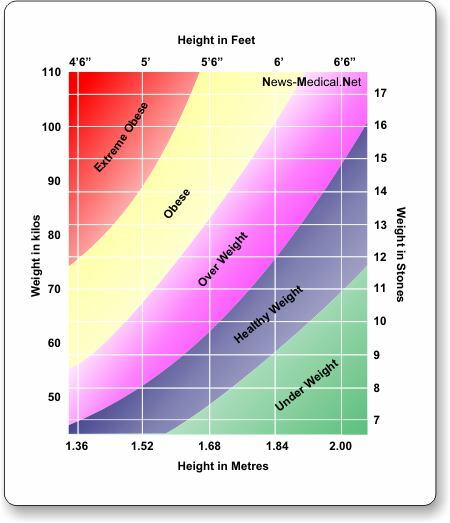 A crude population measure of obesity is the body mass index (BMI) which is a simple index of weight-for-height that is commonly used in classifying overweight and obesity in adult populations and individuals - a person's weight in kilograms is divided by the square of the height in meters (kg/m2). BMI provides the most useful population-level measure of overweight and obesity as it is the same for both sexes and for all ages of adults but it is merely a rough guide because it may not correspond to the same degree of fatness in different individuals. BMI provides a benchmark for individual assessment, but experts suspect that the risk of chronic disease in populations increases progressively from a BMI of 21 upwards. Measuring overweight and obesity in children aged 5 to 14 years is challenging - the WHO Child Growth Standards includes BMI charts for infants and young children up to age 5 - childhood obesity is associated with a higher chance of premature death and disability in adulthood. BMI ranges for children and teens are defined so that they take into account normal differences in body fat between boys and girls and differences in body fat at various ages. However although BMI correlates with the amount of body fat, BMI does not directly measure body fat and some people, such as athletes, may have a BMI that identifies them as overweight even though they do not have excess body fat. The BMI does not tke count for mass of muscle versus mass of fat. A BMI both below and above the so-called normal values can be healthy if there is little fat, but well developed muscle mass. And a person with a BMI less that 18.5 can be too fat if the muscle mass is very scant, but much fat.